Very Good. 352 p. Written by the man Oprah Winfrey calls the US' leading expert on violent behaviour, this work shows you how to spot even subtle signs of danger-before it's too late. It offers specific ways to protect yourself and those you love, including: how to act when approached by a stranger; and when you should fear someone close to you. New. 2000. New edition. Paperback. Written by the man Oprah Winfrey calls the US' leading expert on violent behaviour, this work shows you how to spot even subtle signs of danger-before it's too late. It offers specific ways to protect yourself and those you love, including: how to act when approached by a stranger; and when you should fear someone close to you. Num Pages: 352 pages. BIC Classification: JMM; VS. Category: (G) General (US: Trade). Dimension: 199 x 151 x 23. Weight in Grams: 246. Survival Signals That Protect Us from Violence. 352 pages. Written by the man Oprah Winfrey calls the US' leading expert on violent behaviour, this work shows you how to spot even subtle signs of danger-before it's too late. It offers specific ways to protect yourself and those you love, including: how to act when approached by a stranger; and when you should fear someone close to you. Cateogry: (G) General (US: Trade). BIC Classification: JMM; VS. Dimension: 199 x 151 x 23. Weight: 242......We ship daily from our Bookshop. Very good; Collectible. Fine copy, never read, first printing. Little wear. fast shiping from UK, prompt service, bubble wrap. New. Sewn binding. Cloth over boards. 352 p. Contains: Illustrations, black & white. As a mental health professional I have recommended this book to many clients because it is clear and straightforward in giving good information on how to stay safe without engendering fear. This book empowers the individual to maintain their safety in a variety of situations. I bought this copy for a friend, and I read the book myself every couple of years so the information stays fresh in my mind. I'd recommend this book to everyone, particularly women, and think it should be taught in HS. It explains how to increase your safety living among others (known and unknown) who would rather do you harm. Considering that the American Psychological Association estimates that one out of every 30 or so people in society is a Sociopath (they now call it Antisocial Personality Disorder), it makes sense to be aware and have useful information to protect yourself. Becker is a professional at predicting violent behavior based upon a person's actions, vocabulary, and means of coming on (especially) to a woman. The gift of fear is that feeling or intuition that makes someone feel uncomfortable or unsafe in a situation. This is excellent reading with great advice for girls and women (but valuable to all) as many illustrations and stories are given to illustrate his points. I bought it for all the women in my life as a means of making them aware of dangerous situations that they may have overlooked in the past. Gavin DeBecker's "Gift of Fear" is definitely a must read for everyone...This book has scads of examples, facts, etc., that one needs in order to gain knowledge of how dangerous situations happen, and how one can perhaps avoid these situations. I keep re-reading this book. It contains such a wealth of information and advice, and is very well written. 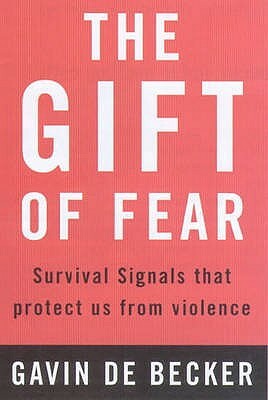 Anyone who experiences fear at any level must read this book! It offers tips and tools, as well as sound advice on being smart about how you deal with fear.